AADT is happy to announce Green Light Testing Services new office facility insides AADT’ building that will allow both the members and AADT clients to truly have a convenient “one-stop shop” for DOT physicals and drug/alcohol collection. Even better, Saturday office hours! Beginning August, both drivers and employers will be able to have those services performed in-house when stopping by the office at 334 N. Euclid Avenue, Unit B, Upland, California. She received a B.A. in Sociology from the University of South Florida in 1985, a Masters of Arts in Counseling Education in 1987 and a Doctor of Chiropractic from Life College in 1996. 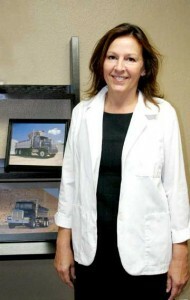 Besides her regular office hours, Dr. Greene can perform on-site drug/alcohol collections for DOT and non-DOT clients. Her services also include performing DOT and pre-employment physicals. Both clients and association members will receive services at a reduced rate. Dr. Greene is also available for “after hours” alcohol and urine drug collections including post-accident in a limited service area. Mon: 12P.M. – 5 P.M.
Tue: 8 A.M. – 12P.M. Fri: 8 A.M. – 12P.M. Sat: 7 A.M. – 10A.M. Use of a Schedule 1 drug, amphetamine, narcotic, marijuana or any other habit forming drug is not permitted. A new Federal Motor Carrier Safety Administration program now requires all commercial drivers whose current medical certificate expires on or after May 21, 2014, to be examined by a medical examiner certified and listed on the National Registry of Certified Medical Examiners. California based drivers of School Buses, School Activity Buses, Youth Buses, General Public Paratransit Vehicles, and Farm Labor Vehicles must also use an examiner listed on the Registry.